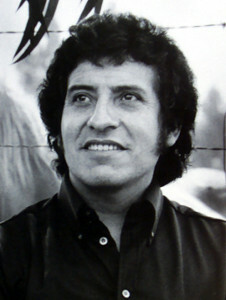 Victor Jara was a Chilean songwriter, poet, and director. He was tortured and killed in 1973 by officers of General Augusto Pinochet's army. Victor Jara is one of the most widely-loved musicians in Chile. Known for his support of the working class, Jara was a key figure in the Popular Unity coalition that helped elect Salvador Allende, the first democratically-chosen Socialist President in Latin America. On September 11, 1973, Allende was overthrown by a U.S.-backed coup led by General Augusto Pinochet. For the next twenty years, under the dictatorship of Pinochet, thousands of Chileans were kidnapped, tortured, and killed. Jara was among those killed. He was tortured and then shot with more than 40 bullets at the Estadio Nacional, a soccer stadium where many opposition leaders were detained and executed. Forty-two years later Chilean officers were charged and convicted of his murder. English: I don't sing for the love of singing, or because I have a good voice. I sing because my guitar has both feeling and reason. It has a heart of earth and the wings of a dove, it is like holy water, blessing joy and grief. My song has found a purpose as Violeta would say. Hardworking guitar, with a smell of spring. My guitar is not for the rich no, nothing like that. My song is of the ladder we are building to reach the stars. For a song has meaning when it beats in the veins of a man who will die singing, truthfully singing his songs. My song is not for fleeting praise nor to gain foreign fame, it is for this narrow country to the very depth of the earth. There, where everything comes to rest and where everything begins, song which has been brave song will be forever new. Spanish: Yo no canto por cantar ni por tener buena voz, canto porque la guitarra tiene sentido y razón. Tiene corazón de tierra y alas de palomita. Es como el agua bendita, santigua glorias y penas. Aquí se encajó mi canto como dijera Violeta; guitarra trabajadora con olor a primavera, Que no es guitarra de ricos, ni cosa que se parezca, mi canto es de los andamios para alcanzar las estrellas. Que el canto tiene sentido cuando palpita en las venas del que morirá cantando las verdades verdaderas. No las lisonjas fugaces ni las famas extranjeras, sino el canto de una lonja hasta el fondo de la tierra. Ahí donde llega todo y donde todo comienza, canto que a sido valiente siempre será canción nueva.